I first heard about Bruges Waffles when I was watching Man vs. Food on the Travel Channel. This show had come to Salt Lake City and visited many different places; Bruges Waffles was one of those places. When I saw the food I was captivated, it all looked so good. Ever since I had seen this show I had wanted to go to Bruges. It took me another year before I went and tried this amazing place. I regret not going sooner!! Bruges Waffles is located right across downtown Salt Lake&apos;s Pioneer Park in a very small shop. When you walk in you can smell the aroma of their frites (fries). The first time I went, I ordered the vanilla waffle (traditional) with vanilla bean ice-cream and strawberries. When I took my first bite I was amazed. I have honestly never tasted something so good. The waffle was warm, crunchy on the outside and soft on the inside. 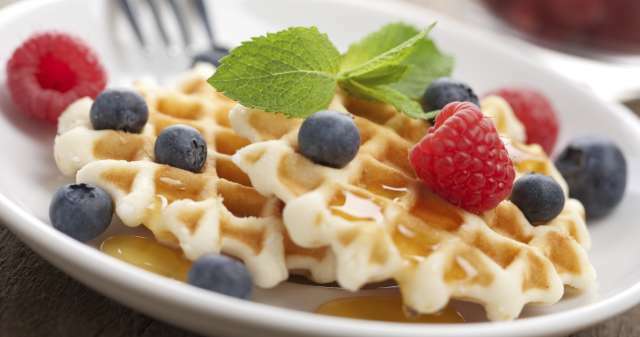 The flavor of this waffle can only be explained as amazing, These waffles are a food that everyone should experience - whether you have a topping on it or if you have it plain - you will be amazed at the flavor of these authentic Belgium waffles! The second time I went to Bruges Waffles I ordered their famous Machine Gun, which is a sausage sandwich served on a baguette roll, with Bruges&apos; delicious sauce over top of their frites. Everything about this sandwich was pure heaven. The sausage has a great flavor with a small kick, the baguette was fresh, and the fries- well, I know now why they are world-famous! Their special sauce brings the whole sandwich together. This sandwich is unlike any other, a must try. I do recommend you share this sandwich with someone because it is quite large and very filling. I suggest this restaurant to anyone who lives in Salt Lake and who is visiting. It is definitely a gem and needs to be experienced by all! Elizabeth Worley was a marketing and communications intern for Visit Salt Lake, and is studying public relations and corporate communications and Utah State University. She is from Salt Lake City and likes history, art and travel.